NASA WALLOPS FLIGHT FACILITY, VA – Following further weather delays this week Orbital Sciences Corp. commercial Antares rocket is at last set to soar to space at lunchtime Sunday, July 13, from a beachside launch pad in Virginia carrying a private Cygnus cargo freighter loaded with a diverse array of science experiments including a flock of nanosatellites and deployers, student science experiments and small cubesat prototypes that may one day fly to Mars. The privately developed Antares rocket is on a critical cargo resupply mission – named Orb-2 – bound for the International Space Station (ISS) and now targeting liftoff at 12:52 p.m. on July 13 from Launch Pad 0A at the Mid-Atlantic Regional Spaceport (MARS) at NASA Wallops Island on Virginia’s Eastern shore. 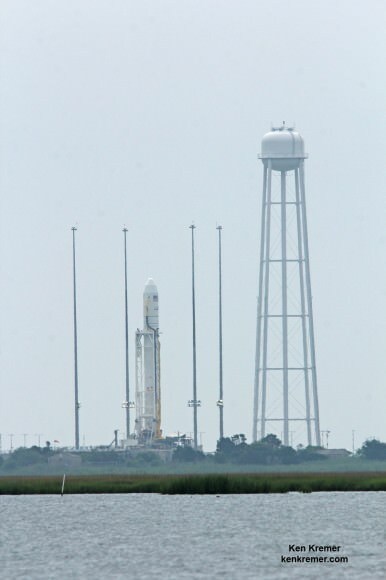 Severe thunderstorms up and down the US East coast forced two consecutive postponements this week from the Atlantic Ocean region launch pad at NASA’s Wallops Flight Facility, VA, from July 11 to July 13. 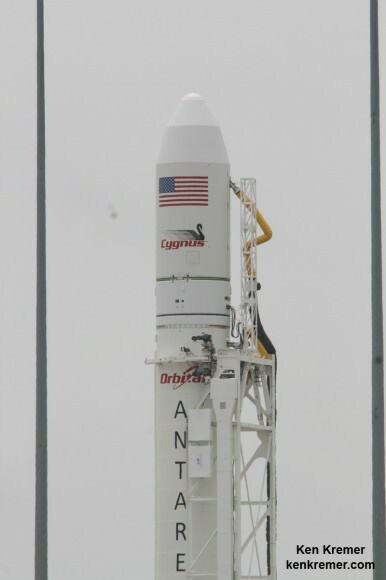 “Orbital’s launch team has made great progress in preparing the rocket for the Orb-2 mission, which will be the fourth flight of Antares in the past 15 months,” Orbital said in a statement. A flock of 28 nanosatellites from Planet Labs of San Francisco are aboard to take pictures of Earth. After deployment from the Japanese JEM module they will form “the largest constellation of imaging satellites in Earth orbit,” said Robbie Schingler, Co-Founder of PlanetLabs. “The individual satellites will take images that will be combined into a whole Earth mosaic,” Schingler told me in an interview at Wallops. 15 student experiments on the “Charlie Brown” mission are aboard and hosted by the Student Spaceflight Experiment Program, an initiative of the National Center for Earth and Space Science Education (NCESSE) and NanoRacks. “The student experiments were chosen from over 1000 proposals from Grades 5 to 12,” said Jeff Goldstein, NCESSE director. They will investigate plant, lettuce, raddish and mold growth and seed germination in zero-G, penecilium growth, corrosion inhibitors, oxidation in space and microencapsulation experiments. The TechEdSat-4 is a small cubesat built by NASA’s Ames Research Center in California that will investigate technology to return small samples to Earth from the space station. The weather prognosis is very favorable with a 90% chance of acceptable weather at launch time during the 5 minute window. The best viewing will be in the mid-Atlantic region closest to Wallops Island. 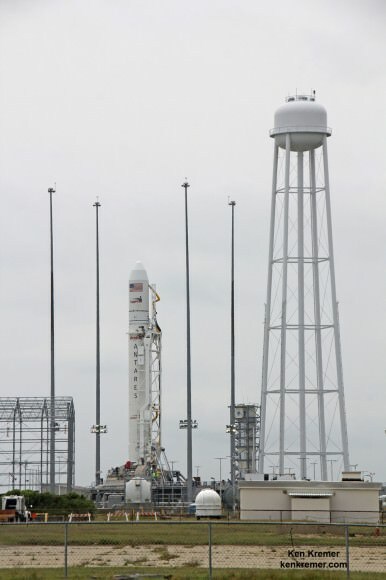 The two stage Antares rocket stands 132 feet tall. 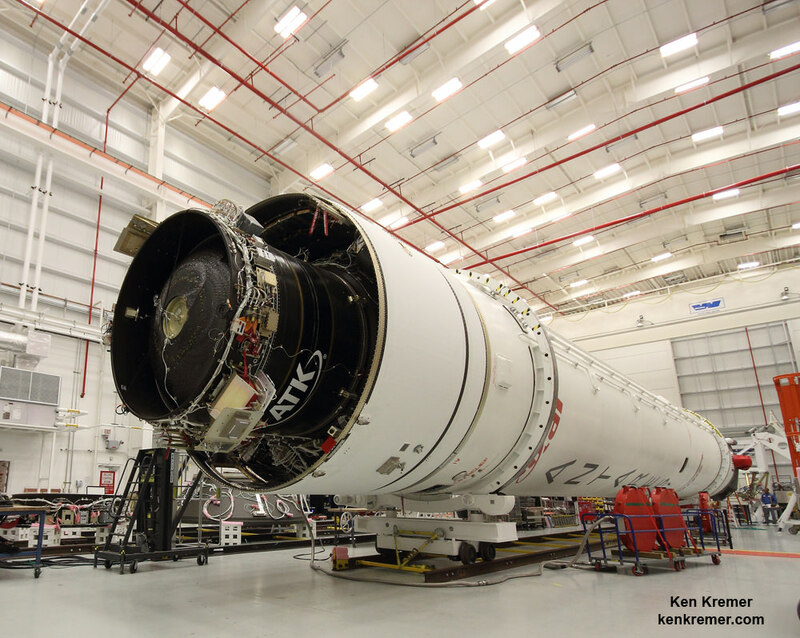 It takes about 10 minutes from launch until separation of Cygnus from the Antares vehicle. Learn more about NASA’s Mars missions and Orbital Sciences Antares ISS launch on July 13 from NASA Wallops, VA in July and more about SpaceX, Boeing and commercial space and more at Ken’s upcoming presentations. I don’t think I notice the elevation of the water tank before, dwarfing a (really) big rocket. I suppose they need the extra head, assuming it’s used for noise abatement during launch?